Spring has apparently arrived down here in kiwi land. I say apparently because it is not what you imagine spring to be like. I am yet to walk outside with a short sleeve top on and so far it has been just as cold and wet as winter has been. The only difference that I have noticed is the early morning chirping of birds and the buds of spring flowers ready to explode with the next ray of sunshine. All this aside its time to get serious about losing that winter podge so this week I have put together this quick, tasty salad using healthy ingredients and my GARLIC MAYO as a dressing. I have started with a simple base of mixed lettuce, carrot and cucumber. Then I add chunks of creamy feta cheese, crunchy toasted sunflower seeds and slithers of flavorful sundried tomatoes. 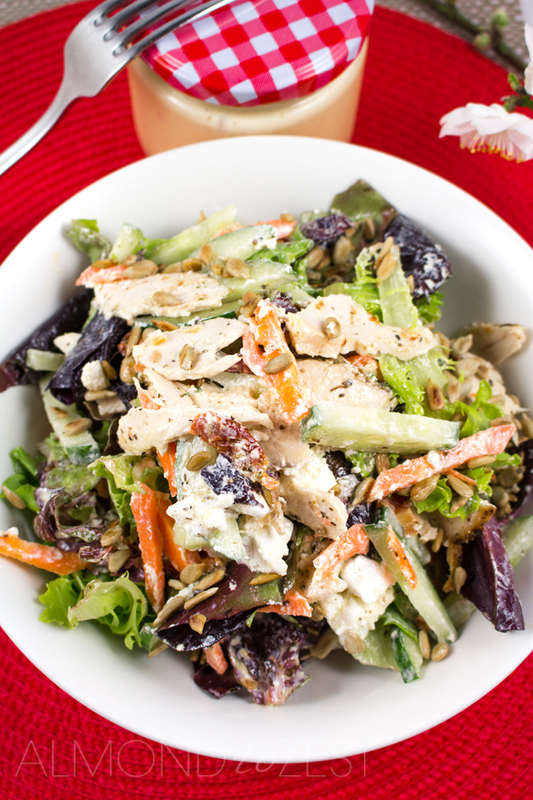 I have used thin slices of my HERB ROASTED CHICKEN in this salad. But if you have left over smoked, grilled or other roast chicken in your fridge you can always use that in the salad instead. For the dressing I have used a good dollop of my tangy GARLIC MAYO. This stunning mayo works fantastically as a dressing as it coats nicely and adds great flavor. 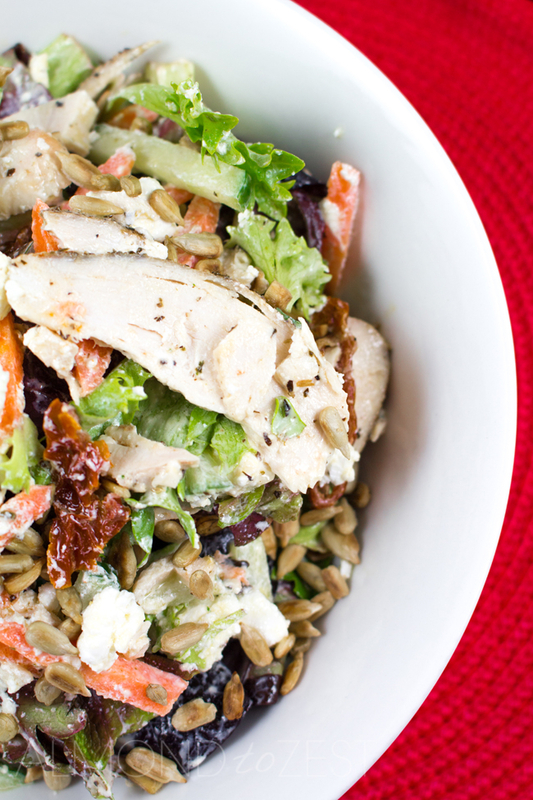 This salad is can be eaten for either lunch or dinner. 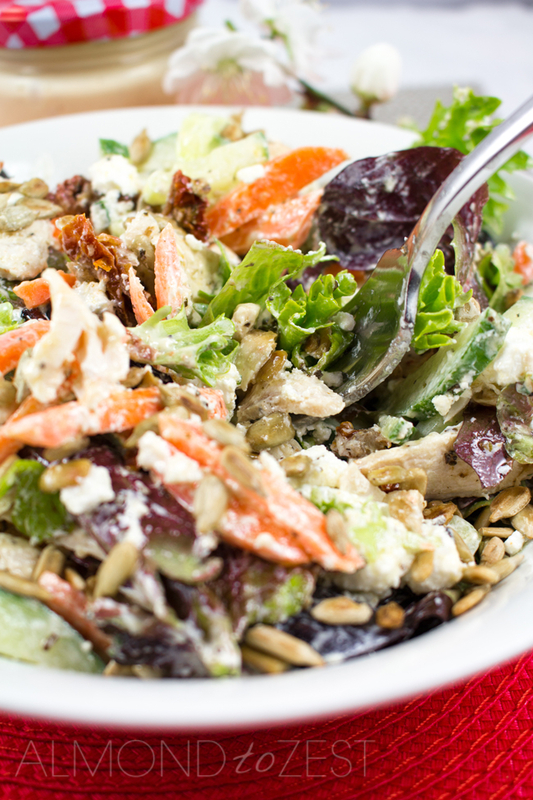 Take a large mixing bowl and throw in the lettuce, carrots, cucumber, feta and sun-dried tomatoes. Thinly slice the HERB ROAST CHICKEN BREASTS and add them to the bowl along with the ROAST GARLIC MAYO. Season with salt and pepper and toss the salad well. Divide among 4 bowls and sprinkle over the sunflower seeds.